Austin and I have made a commitment to turn our conversation to something other than work, kids, and responsibilities when we go on a date. For that reason, we a big advocates of conversation starters. I’m not saying we can’t ever come up with something to talk about without a conversation start. What I am saying, is that it is hard for us as couple to take a break from life and re-connect as lovers. For those that are looking for something to talk about out of the ordinary, here are a list of things you can talk about with your significant other. My dear husband has put together a free printable for you. You can see a list of all the questions in this post. 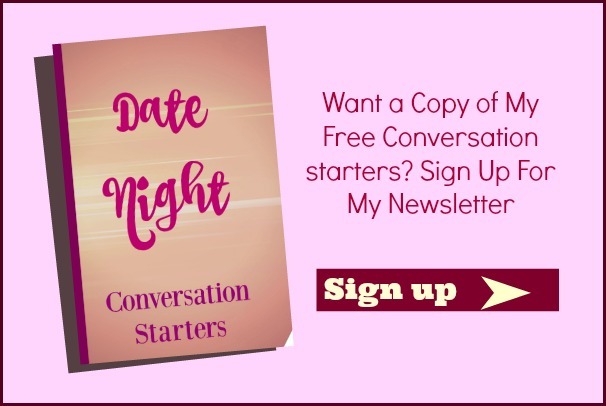 Sign up for my email newsletter through my link below for your free printable for conversation starters. I’ll email them straight to you. If we could go to dinner tomorrow night, where would you take me? If we could give a large amount of money to a charitable organization, where would you want to give it? If you could change your career tomorrow, what would you change it to? If I could change my career tomorrow, what do you wish I would do? If you were to open a restaurant tomorrow, what type of restaurant would it be? If we could buy our dream house, what would it be like? What’s your idea of a great vacation? Would it be possible for us to make it happen? What legacy do you hope we pass on to our children and grandchildren? What do you want to do in our retirement years? Is there a business concept you wish we could pursue together? Would you rather go to the beach or head to the mountains? Where would you want to retire one day? If we could spend an hour doing something extravagant, what would you want it to be? If you could build a roller coaster, what types of twists and turns would you put in it? If someone was to make a movie about our love story, which actor would you cast for your role? What sport do you wish you could play? Is there an activity that you are interested in, but never tried? Would your rather sky dive or deep sea dive? Why? How many times do you try to do something before you give up? In your mind, what makes a house a home? What do you hope our kids will remember most about their childhood? Do you think raising a boy would be easier than raising a girl? Or do you think it would be easier raising a girl over a boy? What do you hope our children learn from our relationship? Give me your best dating advice as if I was your teenage child. What is the best part about our relationship? What do we have in our relationship that you wish all people could experience in their relationships? Tell me one characteristic about me that you wish everyone in the world had. If you could make something with your hands, what would it be? What is your favorite memory from our dating years? What do you remember about our first date? What attracted you to me when we first met? What were you thinking the first time we kissed? What were your first thoughts when you met my family? When did you know you wanted to marry me? Is there a date you wish we could relive? What do you miss from our dating years? When we were dating, did you think we would end up here? Tell me our love story like you are telling it to one of our children. What preparations were made for the proposal? What went through your mind during the proposal? How did you feel after we first got engaged? What was the best part of our engagement months/years? What advice were you given about marriage? What did you enjoy most about planning the wedding? What was on your mind the most during our engagement? What excited you most about getting married to me? What parts of our engagement were difficult? Is there anything you wish we could relive from our time of engagement? What was your favorite part of planning the wedding? What do you wish we had done differently when planning for the wedding? If you could go back to the moment you proposed to me, what would you see in your mind? Describe to me the feeling you had when we set the wedding date? What was it like to try on your wedding day attire? Fun? Stressful? Tell me your fondest memory of our wedding day. What was going through your mind in the hours leading up to the ceremony? What did you think when you saw me on our wedding day? Did you like how things turned out for the ceremony and reception? Do you remember the toast and what was said? Who caught the bouquet and garter? Do you remember any of the songs that were played at the reception? What do you wish we could relive from that day? What advice would you give other people about their wedding day? If we were planning a wedding today, what would you change about the decor and theme? Is there anything that happened that day that surprised you? Tell me about a conversation you remember having on our wedding day? Who was it with? Do you remember what our minister said during the ceremony? Do you remember what song was sung? What was your favorite part of our honeymoon? If we could relive a moment from that week, which moment would it be? If we could take a second honeymoon, where would you like to go? Is there something that you wish was different about that week? What surprised you most about that time together? What is your favorite picture from that trip? Do you remember where we went to eat while we were there? Was the honeymoon what you expected? Here are some great questions to get you started. What would you add to the list? What if I Could Please You Like….